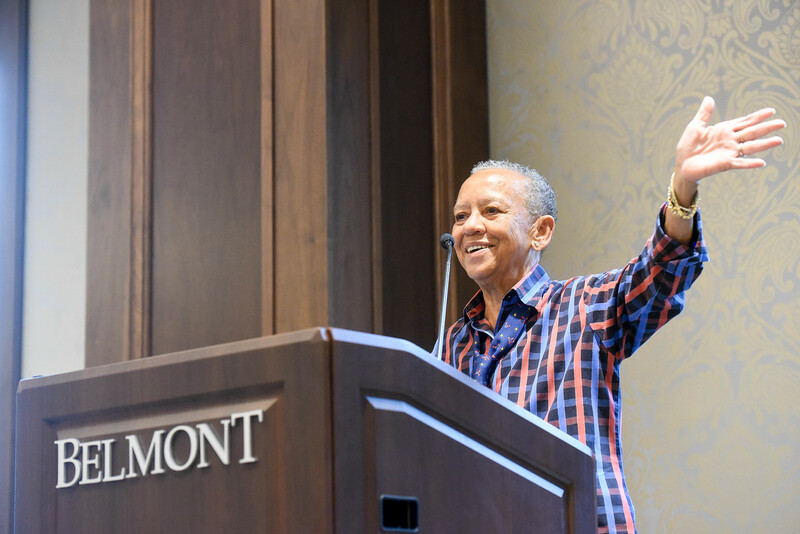 “I am a storyteller more than a poet,” award-winning poet Nikki Giovanni said to students during her recent visit to Belmont. Throughout her time on campus, Giovanni shared not only poems with students, but also stories and wisdom from her life. Originally from Knoxville, Giovanni attended Fisk University in Nashville where she became involved in the Black Arts Movement and got interested in writing, specifically poetry. Giovanni was invited to Belmont’s campus in conjunction with the 2018 Humanities Symposium and as the featured speaker for First Year Seminar . Giovanni was lively and joking with students as she shared a variety of stories from her life that related to her works of poetry. In her speech to the First Year Seminar students, Giovanni told students about her encounters with important people and how unique her experiences with them were. She shared about the time she met Rosa Parks in an airport and about when she met Queen Elizabeth II, complete with her impression of the Queen. Other tales included those about families, friends and ex-boyfriends, but all related, somehow, to each other and to the poems she shared. At another speaking engagement, Giovanni was candid about how her past shaped her. She was also honest about topics such as race, love and how, in her opinion, grandmothers are the best people on earth. Giovanni emphasized that students need to learn “when do I have enough” and noted that they are on the right path simply by being at Belmont and furthering their education.